The term procrastination comes from Middle French and Latin and, of course, means putting something off until later. It is hardly necessary to define this common problem at school–and everywhere else–in any language, however. We all know what it is. We all do it, and we’ve all suffered to some extent because of it (missed deadlines tend to make instructors–and bosses–crabby). This is why this chapter begins with “foundational issues,” perspectives, and beliefs about ourselves such as our world view that operates at the bottom of our pile of motivations, and our sense of self-efficacy (or lack thereof) that generates thoughts that either work for or against us when it comes to successfully managing time, tools, and environments of learning. Self-efficacy is one’s sense of being able to achieve goals. First, here is a look at world view, a concept some experts put at the foundational level of how we think and perceive the world. 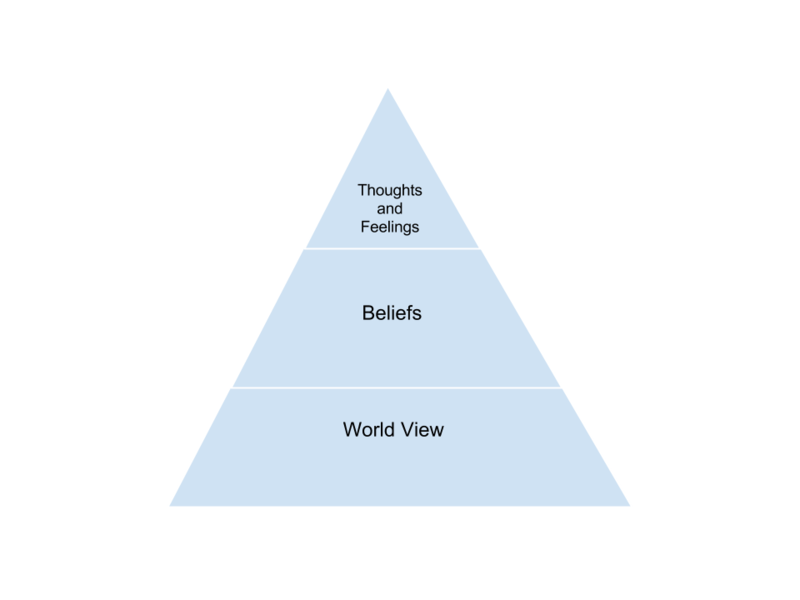 On top of our world view, so to speak, and as a result of it, are our beliefs. And on top of beliefs lay our conscious-level feelings and thoughts. These components cover the fundamental questions about existence that human beings find themselves mulling over in time, questions that ultimately guide beliefs, thoughts, and feelings. The exercise below is based on Heylighen’s article. Whereas this exercise is not a “personal inventory” per se, it has value in guiding the learner to discovering, perhaps, some foundational issues that can hinder a successful approach to overcoming non-productive actions and habits such as procrastination. For example, if a person has a world view that is post-modern, he/she views the world with a heavy dose of skepticism and distrust of ideologies, rationality, and absolute truth. Therefore, it might be easy to subscribe to a “What’s the use?” thought and feeling when it comes to academic and work-world norms such as being on time and getting one’s work done. Note: It is not necessary, however, to know precisely which world view one has been influenced by to complete the exercise. Indeed, most people more or less absorb their world views from parents, institutions, and the culture in which they grew up. The value in knowing such information about oneself is in understanding how to deal with certain attitudes and beliefs that work against successful learning, and success in life in general. It is also valuable to know what has contributed to successful attitudes and beliefs so that these can be affirmed and reinforced for future success. Read the article by Heylighen, linked above, for a more detailed explanation of world view and the seven components he cites. Briefly respond to your thoughts on each of the seven components. If you have not given much thought to some of them as of yet, take time to consider them now. Three to five sentences will likely be sufficient for each component, for a total of approximately 21-35 sentences. It would be helpful to number the components. This does not have to be completed as an essay. Self-efficacy, or one’s sense of being able to achieve goals, is an essential ingredient in a learner’s ability to succeed. Thoughts and feelings on this topic, which stem from one’s beliefs (remember the pyramid illustration) contribute to more, or less, success. A key element of self-efficacy is the concept of locus of control. As the definition indicates, the locus, or place, of control is usually either internal or external, but sometimes it is both. Obviously if a person believes that he/she is in control of situations and outcomes (an internal locus) achieving goals is more likely. If a person believes he/she is controlled by external forces, achieving goals is less likely. But everyone experiences both internal and external forces for various reasons. For example, choosing to do the right thing on the job is based on the external control of workplace rules. Yet, one might apply for the job based on one’s internal belief that he/she can succeed. And both internal and external loci of control are in operation when one chooses to do the right thing at any time based on one’s religious beliefs. For a more detailed explanation and the relationship of self-efficacy to locus of control, complete this exercise. List three attitudes and/or perspectives that a person with a primarily internal locus of control might have that will help him/her succeed in life, and why. List three attitudes and/or perspectives that a person with a primarily external locus of control might have that might hinder his/her success, and why. List three instances where both internal and external loci of control help a person, and why. A chart might help you organize your response. How to Learn Like a Pro! Authored by Phyllis Nissila. Located at: https://openoregon.pressbooks.pub/collegereading/chapter/lesson-2-2-self-efficacy/ CC-BY. Adaptions: Changed world view image, removed one exercise, edited language to match unit and chapter. 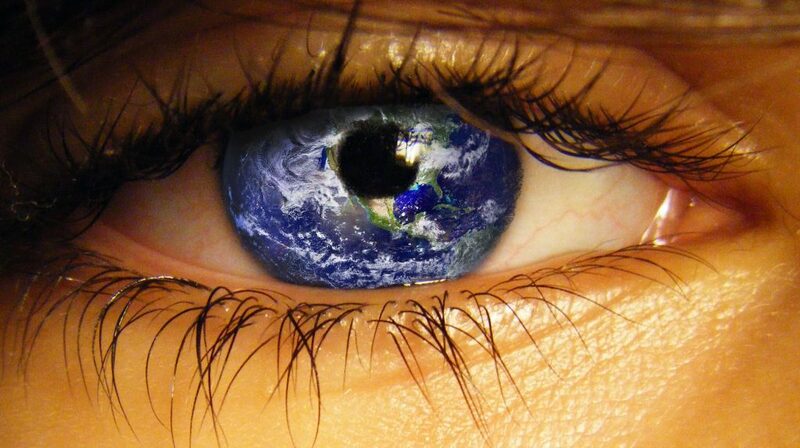 The world in eye (memo) image by colorlight4. License: CC-BY-NC-ND.